If you have any questions or want to enquire about dates, use our form to contact Nigel Slater & Melanie Leach or see their website for more information. Down a delightful road, over an old stone bridge, past red-brick Bridge House, to arrive at a row of three charming, late-Georgian millworker’s cottages (yours is the middle one). You can enter off the street, or via the lane at the back and through the courtyard garden – rather fun! The owners live locally and share a love for historic buildings. Note the simple sympathetic restoration, the immaculate paintwork, and the period touches: vintage French bedside tables in one bedroom, a dear little Suffolk chair in another, velvet armchairs by the old brick fireplace. Embroidered curtains and good pictures hang in the sitting room, the kitchen is contemporary-traditional, the dining extension is flooded with light, and the bedrooms (one king size, one double) lie at the top of the narrow stair. The bathroom – natural Norfolk soaps, toasty heated floor – leads off the kitchen below. It’s a brilliant location, a stroll from the market place of Aylsham (gastropub, monthly market, independent shops) and walking distance from Blickling Hall (a National Trust gem). Norfolk beaches are a hop in the car; so is the City of Norwich. 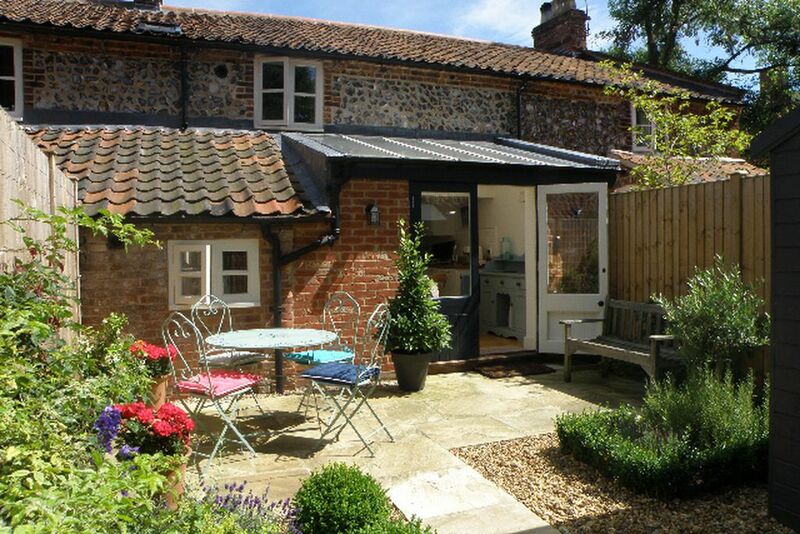 A delightful cottage in the peaceful town of Alysham. Within walking distance of the town centre which has a good pub and several coffee shops. The cottage is tastefully furnished, the lounge cosy and the kitchen well equipped with light coming in through the glass roof and patio doors. The bedrooms are comfortable. We had some good walks, one to Blickling Hall from the cottage and we walked on Holkam beach. We hope to return. This cottage is situated within easy reach of seaside towns and beautiful National Trust houses with gardens. The proprietor's recommended restaurants were delightful. The cottage itself is beautifully fitted out with a light and airy kitchen. Circular walks can be made from the cottage. The welcome pack was exemplary. Visit Blickling Hall, the National Trust's 'Jewel in the Crown' for walks in the park, around the lake, discover beautiful gardens & be wowed by Jacobean interiors. Events & outdoor summer concerts. Not to be missed. Take a trip on the Aylsham Bure Valley narrow guage railway through lovely countryside to Wroxham and combine it with a boat trip. Visit Cromer for a dip in the sea, a walk on the pier, for fresh Cromer Crabs on the balcony at The Rocket House cafe next to the slipway and fish & chips at No 1. with the best view of the pier & sea. Cycle along the country lanes of Norfolk, wind around the back of Blickling Estate to Mannington, stopping off at the Walople Arms in Itteringham for lunch or an ice cream outside the pretty village shop & cafe. Visit the Royal residence of Sandringham for a grand day out & drive back along the coast road. HIre a boat for the day from Potter Heigham, take a picnic and venture out across a beautiful broad to NT Horsey Windpump.